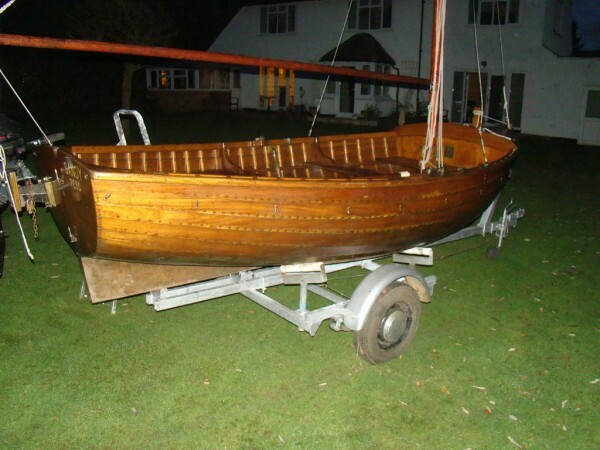 wooden ships comments on this Clinker sailing dinghy built by Seaking Boatyard, Leigh on Sea, Essex. 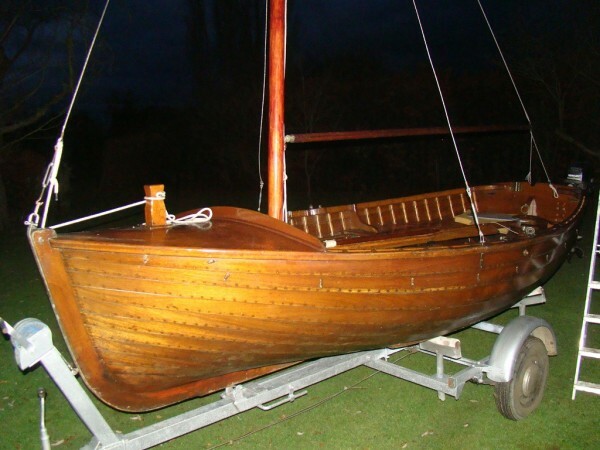 A fine boat with a generous beam which gives her great stability and makes her a dry, buoyant boat. She is presented in very tidy condition and ready to launch and sail. Planked in mahogany, clinker laid and fastened to steamed oak timbers with copper nails and roves all in the traditional manner. The hull is finished in varnish to the water-line inside and out, anti-fouled below the wl. Oak back-bone with grown oak stem piece, varnished transom. Varnished mahogany thwarts and centre-board case. Galvanised steel centre-board on a single whip pull reached by the helm. 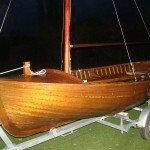 Varnished ply fore deck with enclosed cuddy under, locker doors in the fwd bulkhead above and below the mast thwart. Oak Sampson post through the fore deck. Gunter rig on a varnished spruce mast, varnished boom and yard. The mast has been adapted to sit in a tabernacle allowing to be easily lowered for bridges when river sailing. The boom extends aft over the transom. All spares stow within the length of the boat. Stainless steel shrouds and fore stay to stainless steel chain plates. Modern main sheet blocks with jammer on the lower block. Mainsail and jib in red terylene setting 201 sq’, seen in almost perfect and apparently unused condition. 6hp Mercury outboard engine on a tilting bracket on the transom. Identical engine for spares just in case.